A recent act of vandalism serves as a reminder to have diverse communications capability with you while four wheeling. Vandals cut a major fiber optic cable in Arizona on Feb. 25, disrupting communications throughout the northern part of the state. Cellphone, internet and telephone services were affected, along with ATMs, banks, and other entities. While this was an isolated incident, it serves as a reminder of how vulnerable our communications infrastructure is. You’re more likely to lose comm to some natural disaster, but in these days, we have to be mindful of willful acts of destruction. We often say ham radio communication will be the last standing form in the event of a disaster. This is because each ham owns their own transmitter / receiver and most of it works off the grid – on batteries in the vehicle. Amateur or “ham” radio is a private radio service available to you. It requires a license, for which you take one or more written exams. (There are three classes of license; each requires a written exam.) Once licensed, you have access to various frequency bands and modes of operation. I hold a Technician class license—the first level—and my callsign is KI6FHA. For more on ham radio, check out the website for the American Radio Relay League (ARRL), the national association for amateur radio - www.arrl.org . There are currently over 700,000 licensed ham operators in the United states. The number is growing weekly (at the end of 1991 there were 494,000 hams). In addition to offering more frequency bands, ham radio equipment generally puts out more power. This is especially true of the mobile radios. While a CB radio is limited to 4 watts output, mobile ham VHF/UHF radios (the kind I’m recommending here) transmit with 40 to 50 watts or more. You can find single band 2 meter (more on "2 meter" later) radios that will transmit up to 75 watts in a mobile radio. As a ham operator you can legally transmit even higher wattage but that is not practical in a mobile unit using a car battery. Ham radio operators often access repeaters, as well. Repeaters are standalone transceivers (usually on a summit) that automatically retransmit—“repeat”—the signal. This boosts the effective range of a radio considerably. It is not uncommon to talk with someone several counties away. Now that you’re licensed, it’s time to buy your ham radio gear. Even though you’ll have access to the full ham radio spectrum, for the purposes of this article, we’ll focus on VHF and UHF operation. The most popular band for mobile operation is known as 2 meters. This covers 144 – 148 MHz. A very popular UHF band, often called either 70 cm or “the 440 band”, falls at 420 – 450 MHz (for US hams). Consider a dual-band radio. A dual band radio provide the capability to use both the 2 meter and 70 cm bands. These give you the ability to adapt to the any repeater in places where you’ll be. (You can find repeater frequencies online.) Prices for a good, used dual-band radio probably run around $150 - $200. If you’re a bit strapped for cash, consider just a 2 meter radio. Being the more popular band, you’re more likely to find 2 meter repeaters where ever you’re going. No radio operates without an antenna. For newcomers, I recommend starting with a mag mount style. The mag mount will get you on the air quickly. After you become familiar with your ham radio gear, install a permanent antenna. You set the antenna on the trunk or rear bumper, and string the coax through a window. A down side to a mag mount antenna on the roof of your vehicle is it is easily knocked off if you drive through heavy brush. A good dual-band mag mount antenna can be had for less than $50, based on a quick peek online. You may have to tune (adjust) the antenna for maximum performance. Most ham radio operators would be happy to assist with that. Popular brands include Alinco, Kenwood, Icom and Yaesu. Ask some ham radio operators for their suggestions, then try out a few models. Ditto for antennas. I highly recommend the Yaesu FT8800R. It is a bit expensive but it is a dual band radio that has two radios side by side built into one small package. You could talk vehicle-to-vehicle on one radio and listen to a repeater on the other radio. Dual band feature (2 m / 70 cm) - access any repeaters as you travel regardless if they are 2 meter or 70 centimeters. High output wattage - nice to have extra power to reach a remote repeater. There seems to be a tradeoff between power and dual band. Most single band 2 meter radios have more output power. Removable control head - increases mounting options in the vehicle. The bulk of the radio and can go under a seat or in the trunk. Sealed radio - the cooling fan should not pull air (and, therefore dust) through the radio. NOAA weather alert - important to keep an eye on the weather when off road. Ease of use. This is a bit relative. Today’s radios have so many functions, they can be challenging to program the first time. Another reason to get yourself a mentor (known as an Elmer). You may like other features; this is just a start. And I should mention that ham radio isn’t restricted to off-road use. Heck, you’re welcome to operate wherever and whenever. In fact, put your ham radio skills and driving skills to use by helping out in a charity ride. You’ll have fun, polish your operating skills, and help a worthy cause. Incorporating ham radio equipment into your 4WD vehicle adds a new dimension to your communication capabilities. It is very useful for routine operating, and could make a big difference during an emergency in a remote area. Your Gear Is Not Complete Without An Emergency Packet! What Causes Wash Board Roads? The following will be the last clinics in Borrego Springs until this fall. We have our new stock with many new colors (Red, Orange, Green, and Blue) on hand. The Bandana is packed full of useful information and is a quick reference in the field when no DVD player is available." The Bandana layout follows the “Vehicle Recovery Plan” with pathways to more detail. A unique section of the Bandana, gives the steps for a “Winch Rigging Check: Walk through” so that you verify every element of the rigging before you commit to the pull. Stuff this in your recovery kit and you will always be ready! Pick up or order the Winching DVD too! There is no substitute for hands on training. 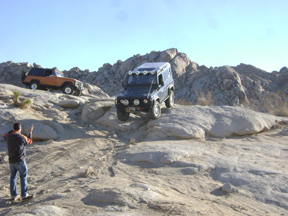 If you can, sign up for one of Badlands Off-Road Adventure’s Winching Clinics. Warning – the Bandana and DVD are not a substitute for proper training and use of quality equipment that is used within the bounds of their safe working load. 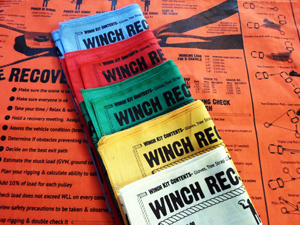 We advise you to use the information provided in both the Winching Recovery Bandana and the "Basic to Advanced Winching and Recovery DVD" at your own risk. We cannot control the quality and specifications of the equipment used and the methods actually employed. 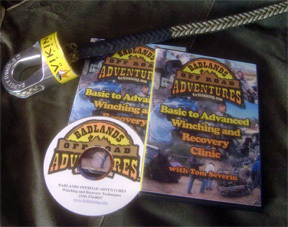 Order a	Basic to Advanced Winching & Recovery DVD too! 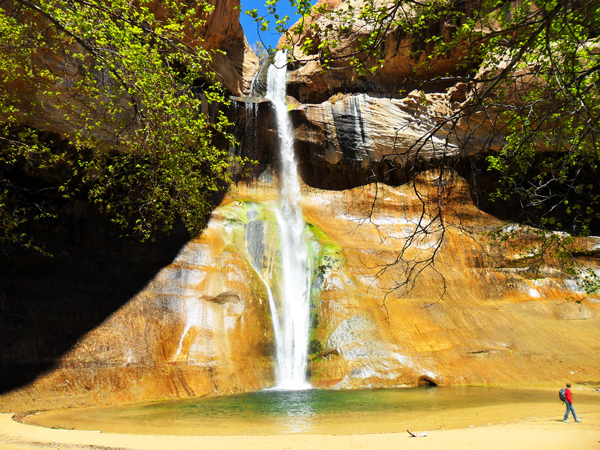 Copyright 2015, Badlands Off-Road Adventures, Inc.